Meal Notes: This is a beautiful, flavorful dish that makes a full meal fit for company. Just add couscous. I’m including a handful of FAQ notes below on ways to either circumvent or lean into the nuances of Moroccan cooking, such as purchasing a tagine pot,* seasoning said tagine pot,** and making preserved lemons from scratch. *** If these sound like fun challenges to you, awesome! If not, you can breeze right on over them. 1 14 oz can whole plum tomatoes. Prep: Mince the parsley and cilantro. Mince the garlic. Quarter and then thinly slice the onion. Cut the tilapia into serving sized fillets. Open can of plum tomatoes and roughly chop the contents, retaining both the tomatoes and their juice in a small bowl. Peel and slice the carrots diagonally. Cut the lemon in half. Juice half the lemon and cut the other half into very thin slices. Lightly toast the saffron threads in a skillet until fragrant (about 1 minute), then crush toasted threads in a large bowl. Marinate Tilapia: To the large bowl with toasted saffron, add the parsley, cilantro, olive oil, paprika, and ground ginger. Mix. Add half the lemon juice. Stir to combine. Coat the fish fillets with this mixture and refrigerate on a covered plate for 1-2 hours, turning over once or twice. Make Sauce: In a large saucepan, combine the chopped tomatoes with their juices, garlic, cumin, and tomato sauce. Cook over medium heat, stirring occasionally until the sauce thickens slightly, 8 to 10 minutes. Season with salt and pepper. Set aside. Cook Vegetables: Place the carrots in a single layer on the bottom of your tagine pot or dutch oven. Cover carrots with the onion slices. Spoon the tomato sauce over the onion. Cover and cook over medium heat until the carrots are tender (15 to 20 minutes). Cook Tilapia: Remove pot from the heat and rest the marinated tilapia on top of the vegetables, reserving marinade. Spread a little preserved lemon pulp over each fillet and top each one with a slice of fresh lemon. Spoon reserved marinade over the fillets. Cover the pan again and cook until the fish is flaky, 10-12 minutes. Finish: Spoon some of the sauce over the fish. Garnish with parsley and cilantro. Serve immediately. *Do I really need a tagine pot? : Short answer, no. You do not need to own a tagine pot in order to make this or any recipe. A dutch oven will give you very similar results. 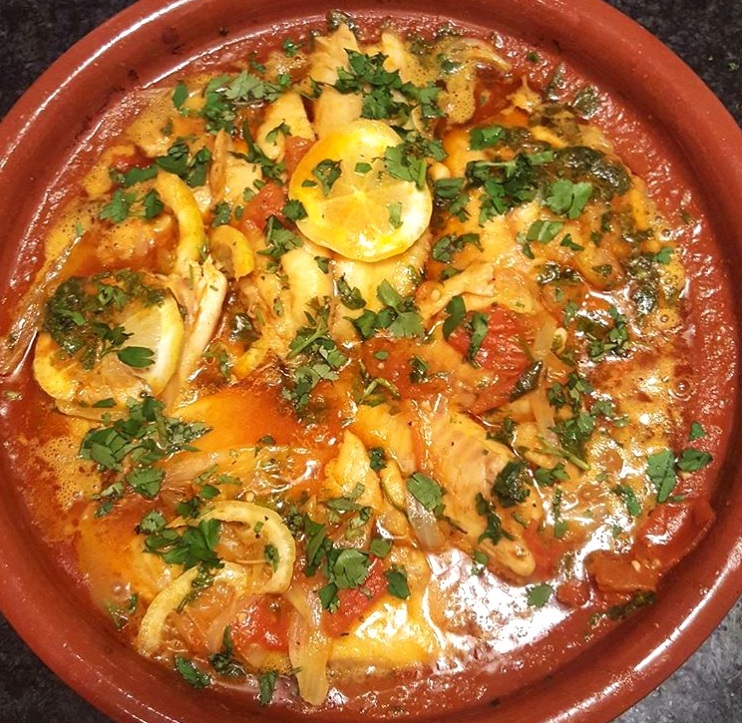 That said, if you plan to make a lot of Moroccan food, it might be worth investing in a clay tagine, partly because they make for beautiful food presentation and partly because they have a unique, magic ability to brown meat while keeping it moist at the same time. I purchased this pot for under $40 on Amazon a couple of years ago and it’s holding up well. 2) After 3 hours, dry the pot and let it sit for 1 hour. 5) After 2 hours, turn off the oven and leave the tagine to sit until it’s completely cool. 6) Continuing Care: You’ll need to hand wash your tagine pot, since it’s not dishwasher safe. If you go 6 months or more without using the pot, you’ll also need to repeat steps 3-5 of this process. ***A note on preserved lemons: You might be thinking that preserved lemon pulp is probably unnecessary and you can skip it in favor of lemon zest. I suspect this because I had the same thought when I first encountered this recipe. But I would urge you to resist this urge. The preserved pulp truly does add an irreplaceable dimension to the flavor of this recipe. If I’ve persuaded you to invest in preserved lemons (yay! ), you have two options: purchase a jar of preserved lemons or make preserved lemons from scratch. Having tried both options, I’m going to encourage you not to be hero here and just purchase the jar. Truth be told, my homemade results were only so-so compared to the store-bought version. On top of that, the biggest downside of DIY preserved lemons is that they’ll need to sit in your refrigerator for at least 7 days before you can use them. I don’t know about you, but, for me, that feels like a stratospheric level of advance planning.